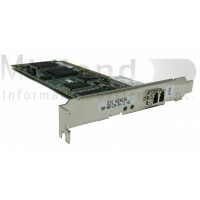 #2766 provides Fibre Channel attachment capability for external disk devices. The #2766 supports point-to-point and arbitrated loop topologies. Each #2766 is shipped with a wrap connector (PN#05N6767). #0371 - LC-SC Adapter Kit (50um) can be ordered, both on initial and field upgrades. This optional kit is used to attach SC-type fibre (50 micron) cables to a #2766. This kit contains a 2m LC-ST cable and ST-SC adapter for 50 micron fiber. #0372 - LC-SC Adapter Kit (62.5um) can be ordered, both on initial and field upgrades. This optional kit is used to attach SC-type fibre (62.5 micron) cables to a #2766. This kit contains a 2m LC-ST cable and ST-SC adapter for 62.5 micron fiber. An optics cleaning kit and instruction sheet instruction are included when a #2765/#2766 is ordered. Customers must supply all Fibre Channel cables for this controller. OS/400 V5R1, or later, is required. Prerequisite: Feature #2766 must be ordered in conjunction with RPQ 847126. At least one fiber optic cable is required for attaching devices to features #2765 and #2766. Fibre optical cables are customer supplied to enable maximum flexibility and compatibility with various environments. Fiber Transport Services offered by IBM Global Services can provide additional fiber optic cables, and fiber optic cabling solutions. IBM Networking and Connectivity Services provides structured, modular, fiber optic data center connectivity solutions as part of its Fiber Transport Services (FTS) offering. Pre-terminated fiber optic trunk cables in standard lengths and fiber optic jumper cables in standard lengths are available as part of the planing, fiber optic commodities and installation activities performed by IBM personnel. Custom lengths and custom installation of fiber optic cables, both multi-mode and single mode, can also be provided. Contact your local Installation Planning representative, Product Specialist, or Connectivity services Specialist for more information on Fiber Optic Cabling Services.